Free raffle drawings throughout the day with a Grand Prize drawing at 1:00pm. Must be present to be eligible for the Grand Prize. T-Shirts will be available for $10 with sales benefitting Missouri Lost & Found Paws and Dogs on Duty. 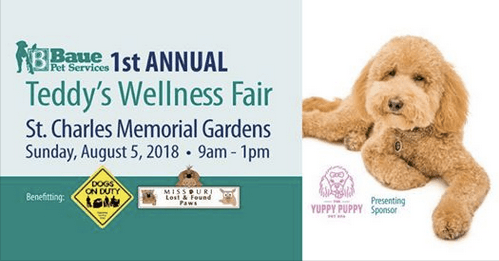 A huge thank-you to The Yuppy Puppy Pet Spa for sponsoring this day of wellness and fun for our furry friends because pets are family too.